Julius Shulman (1910–2009), one of the foremost architectural photographers of our day, achieved international acclaim with his pictures of the architecture of the postwar and Kennedy eras. Shulman not only set standards in modern architectural photography, working with the preeminent architects of his time, he also defined a completely new style of architectural photography. Shulman elevates architectural photography above the slavish illustration of architectural history to become a pictorial medium in its own right, with far-reaching functions going beyond representation. German born photographer Jürgen Nogai and Julius Shulman began a rewarding collaboration in 2000 which lasted almost a decade until Shulman's death in 2009. Together they continued to develop their unique style, worked on projects, and published in books and magazines. Nogai’s work is part of the permanent collections of the Los Angeles County Museum of Art, the Palm Springs Art Museum and Deutsches Architektur Museum, the Frankfurt Design and Architecture Museum, Germany. 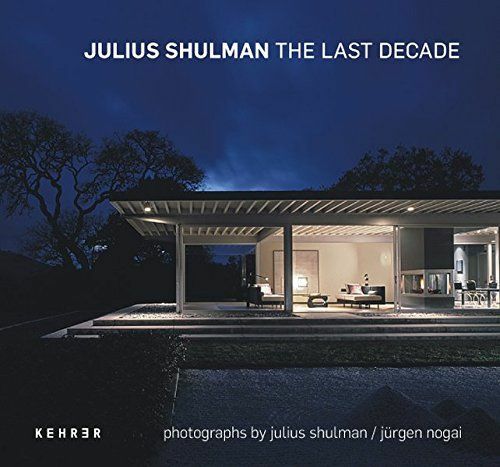 This publication is released on the occasion of Julius Shulman’s one hundredth birthday and presents works from the joint archive of Shulman and Nogai resulting from their ten year partnership, many of them published for the first time in a book.